Canonmills lies in a low hollow just north of Edinburgh’s New Town. Originally a loch, the area was drained in the 18th and 19th centuries. The origin of the neighbourhood’s name is from the Augustinian Canons of Holyrood Abbey. They operated a mill on the land from the 12th century. 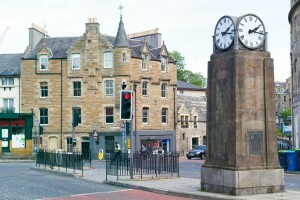 North of Edinburgh’s City Centre, the area has a lot of good local amenities and shops. Its properties vary from traditional Victorian flats to modern developments and townhouses. Canonmills is within easy reach of the Edinburgh City Centre, but also has a number of restaurants, bars and shops of its own. The Roamin’ Nose, the Bluebird Cafe and New Chapter restaurants offer traditional European food, while the Loon Fung Chinese restaurant is one of the best in Edinburgh. Right next to the picturesque Inverleith, Canonmills is a stone’s throw from the Royal Botanic Garden and Inverleith Park. As Canonmills is located in the City Centre, it is an easy walk to Princes Street, has excellent bus links and is a 15 minute walk from Edinburgh Waverley train station. If you have a car, most properties in the area offer on-street parking. However, usually a permit is required. This can be arranged through the Edinburgh City Council. There are a number of highly rated local Primary Schools. This list includes Stockbridge Primary School and St Mary’s RC Primary School. Canonmills is in the catchment area for Broughton High School and St Thomas of Aquin’s RC High School, but is also within in easy reach of a number of public schools including Erskine Stewart’s Melville Schools, St George’s School for Girls, The Edinburgh Academy and Fettes College. North of Edinburgh’s New Town (EH2 & EH3), Canonmills (EH3) is close to Broughton (EH1), Stockbridge (EH4), Inverleith (EH3) and Leith Walk (EH7).